General Instrument, U.S.A. company with international divisions. In Sepetember 1969 the journal Electronics reported "Japan's Sanyo Electric Co. is seeking government approval of a licensing arrangement reached with General Instrument Corp. Under the arrangement, Sanyo will at first import and then manufacture the U.S. firm's metal, thick-oxide nitride silicon LSI circuits for use in the Japanese company's new miniature desk calculator. The calculator is expected to go on the market early next year. Terms of the 10-year licensing arrangement call for General Instrument to receive an $80,000 initial payment and a 3.25% royalty. Although Sanyo will be allowed to sell the LSI circuits separately, the company didn't win an exclusivity clause. Sanyo is investing $4.17 million in new production facilities to manufacture the circuits. Domestic production is expected to start in June; the company's initial goal is 70,000 circuits. The calculator itself has been redesigned so that each machine will require only four or five LSI circuits." The Sanyo IC-0081 Mini Calculator, of 1970/1 used integrated circuits marked with the "GI" logo of General Intruments Microelectronics. The company had some second sourcing arrangements with Ferranti of the UK, and also a plant in Glenrothes, Scotland, where many of the calculator chips were manufactured. 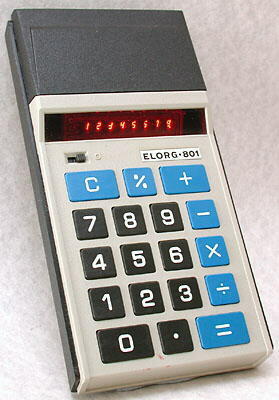 The report Electronic Calculator Markets and Suppliers, of 1974, says "GI is believed to be shipping 1/4 million [calculator integrated] circuits per month, and has supplied nearly all British manufacturers. In addition to which GI chips are used by Monroe, Victor, Commodore, Royal and Singer in the USA, as well as Sanyo in Japan. Rather greater volumes of chips are shipped by Texas Instruments and Rockwell, but it is General Instruments, in Britain and worldwide which tends to provide the greater support for the independent [calculator manufacturer]." Like Texas Instruments and Rockwell, General Instrument decided that there was a profit to be made in manufacturing the finished calculators as well as the integrated circuits. 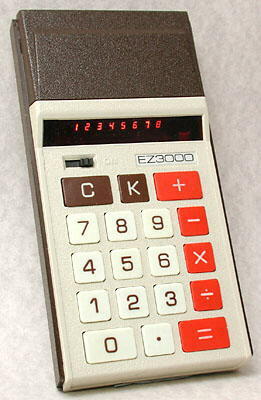 It produced a range of distinctively styled LED display calculators in the mid-1970s, but after a couple of years, when the price of calculators plummetted, together with the profits, it appears to have sold the designs to the U.S.S.R. (Russia). Similar designs appearing under the Elektronika and Elorg names were produced for a number of years under the command economy of the U.S.S.R., when such designs were long obsolete elsewhere. See the page General Instrument EZ3000 and varieties. Manufactured in U.S.S.R. after the designs were sold off. For further photographs of General Instrument calculators see the Calculator Photo Library on this site.